GARMENT TRAINING IS nearly READY TO GO! After over 3 years of research and writing in collaboration with Chuck Kukla (our USA editor) and Chris Townsend ( renowned TGO – gear tester) we are nearing completion of part 1. This has involved a dialogue with 15 outdoor brands, and key independent retail stores, Climbers Shop/Joe Brown. Our dialogue with mountain guides and outdoor instructors has also been extensive and resulted in a one day CPD workshop in Kendal, which was very well received. Part 1 of our book and training, Keeping Dry and Staying Warm, is ready to launch in the next few months after trialling the training system.There is no independent training for outdoor shop staff available and ours will be the first leading eventually to staff certification. Chapter 1 explains everything about garment sizing, fit, grade ( the designers incremental steps between each size) and how garments are specifically tailored to be functional for each of the different outdoor sports, with a special focus on hood design (which can be as much as 20% of the total cost of some garments). Chapter 2 helps create the base understanding needed by all retail staff by describing 9 different types of garment in terms of 5 ‘F’s Function, fit, future durability, finance and fashion. Chapter 3 is about the basics of layering and best practises. Part 2 will be published separately and later. This covers the basic science around three interrelated subjects, human metabolism, food and nutrition (written from the perspective that when you are really out in the wilds, the only source of heat is food) and how we lose heat from our body and through our layers by evaporation, conduction, convection, radiation. 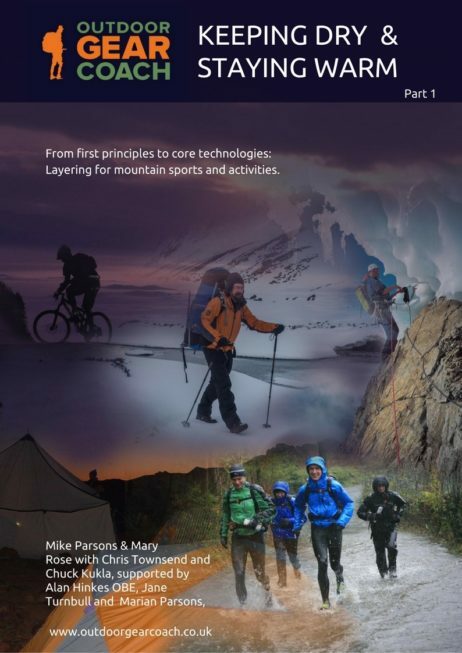 This is complemented by an explanation of the core technologies used for outdoor garments, from fibres through fabrics through insulation and waterproof materials. Moisture management is a key chapter.